This Grizzly Bear is approximately 8' tall and 3' wide. He is standing up to his knees in water with fish. 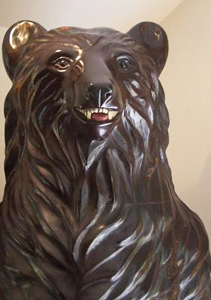 My grizzly bear is beautifully carved, a custom massive piece of artwork, one of a kind. He is perfect, down to the rise across his shoulders. 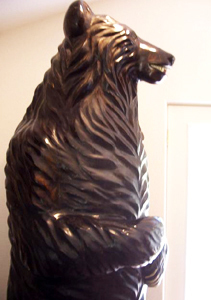 He was carved to scale, the artist used a photo of a grizzly bear standing in water from Alaska. We live in a house with large windows that open to the forest. 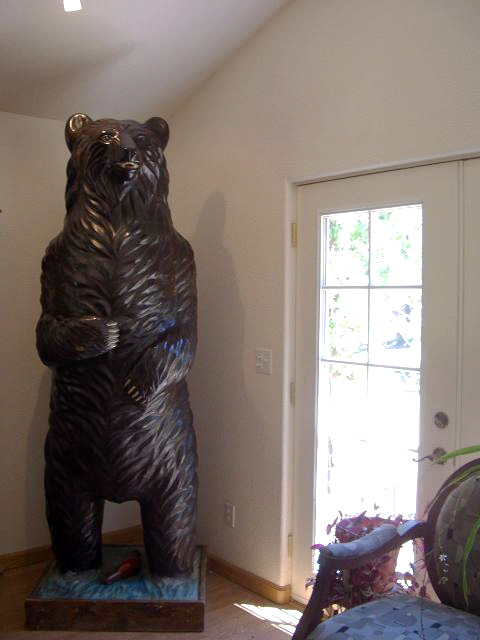 Our bear stands in a corner of our living room facing the front door and the living room windows. I forget that he is so big and so imposing and so beautiful. My niece came over with her three year old daughter. The first time the child saw him, she walked up to the bear, put her hands on her hips and studied him for a few minutes. She looked so tiny next to him. She nodded her head, lips pursed and walked over to her mother. "Yes. I think I like my soft teddy better." Everyone that comes into the house has to walk over and touch him, they stroke his paws, like they were soft and real. When our guests leave, they generally go over pat his arm and say goodnight to him. The younger members of the family insist that he wear a hat on New Years eve, complete with cigar in his mouth and at Christmas he has a wreath of pine and flowers draped around his neck. One year, we made him look like Father Christmas with a wreath and candles on his head and a soft red cape trimmed in white fur around his shoulders. For awhile when my granddaughter was staying with us, she put a life size toy parrot on his arm and a pirate hat on his head complete with patch on his eye. Occasionally a doe will come to the French doors and just stare at him. I truly would like for him to go to a home where he will bring as much laughter and fun to his new family as he has to ours. He is an inside bear and is quite beautiful. He was carved by a carousel horse carver, Mr. O'Day who lives in Angels Camp in California. My bear is one of a kind. Mr. O'Day used a picture of a live grizzly bear as his model. I had brought it back from a trip to the Northwest and asked him if he would be willing to undertake such a massive project. The bear turned out better than I had ever expected. We are moving and will not have the space for him any longer. Created by Mr. O'Day & Son out of Angels Camp in California, 1997.